Get these out of my house! 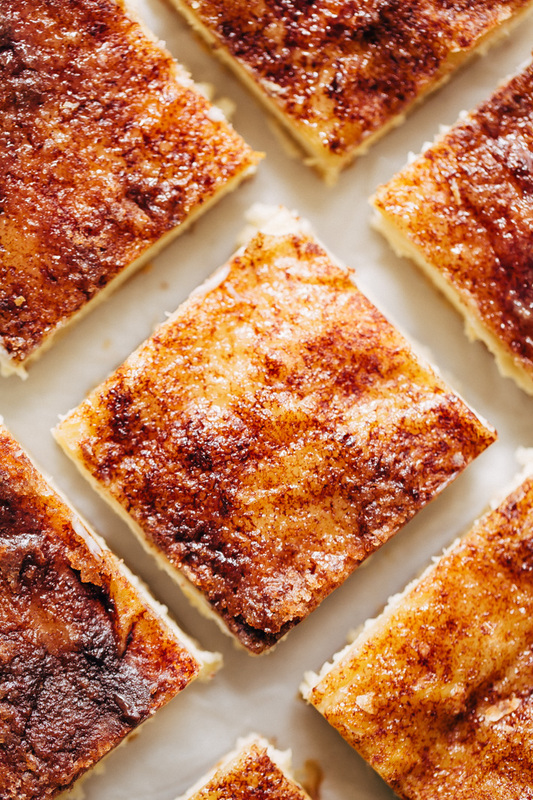 Thick buttery, crispy double-crusted cheesecake bars, brushed with melted butter and sprinkled with cinnamon sugar. On the inside we’ve got a gooey, creamy cheesecake filling. Like I said, seriously the best, most addicting thing ever. Dessert has been my favorite meal of the day for the majority of my life. Because surely by now all adults have realized that DESSERT is in fact a separate meal of its own. But this weird thing started happening in my late twenties where salty truffle fries and cheesy nachos all of a sudden started tasting a whole lot better. But ever since we went low carb, it seems like all the dessert ideas/cravings are just popping into my head more frequently than usual. It’s that whole concept of wanting what you can’t have. Self proclaimed sugar queen right here. ?? 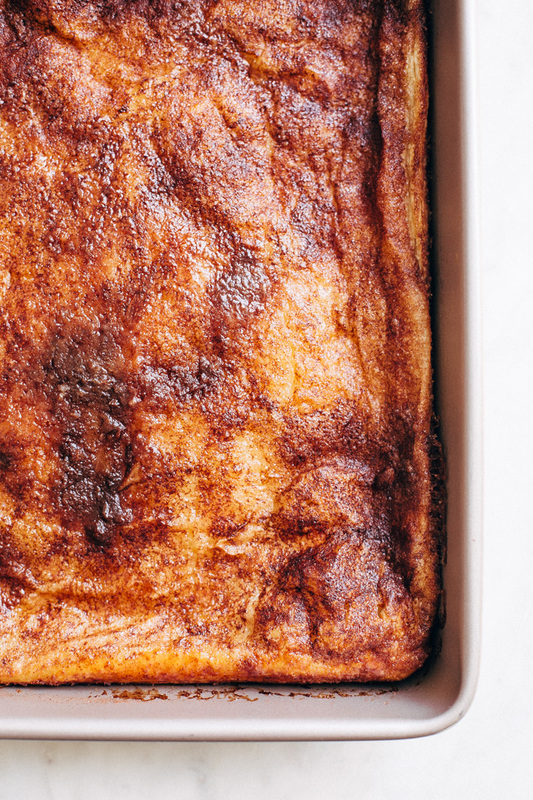 So here’s the deal, normally the only kind of dessert that disappears from this house as fast as these sopapilla cheesecake bars did usually have a drizzle, a sprinkle, or are completely submerged in chocolate. Both the hubby and I come from a family who LIVES for chocolate. Every single one of us. So it was pretty shocking to see these sopapilla cheesecake bars disappear as quickly as they did. But I guess when you’ve got a kinda sweet and a little salty sort of addicting flavor profile and cheesecake filling in the middle, it doesn’t matter that there isn’t chocolate in the picture. When I was concept planning and thinking about making some kind of cheesecake filled snickerdoodle type bar situation, I ran the idea over with Anees and as usual with anything that doesn’t involve chocolate, I got the head nod, the shifty-eyed ponder, followed by that one question. Will you drizzle it with chocolate? Oy. It’s hard to convince a man who loves chocolate so passionately that not everyone else in the world feels the same way. I ran with the original idea and on Thursday, when he got back from out of town, after dinner I told him I had a dessert I wanted him to try. Two bites in, I knew he was hooked. Not because he actually had a chance to say the words but because of the silence. Silent bites sometimes convey more to me than actual words spoken. He went back for a second bar. Then I heard how good they were. ? And that’s when I knew. These bars need to GET OUT OF THE HOUSE. I passed some along to family, some to friends and left a very small portion for us. Because the weirdest thing started happening. In the dead of the night, these bars had a way of disappearing on us. Best when consumed cold, with the incriminating light of the refrigerator shining down on the assailant. 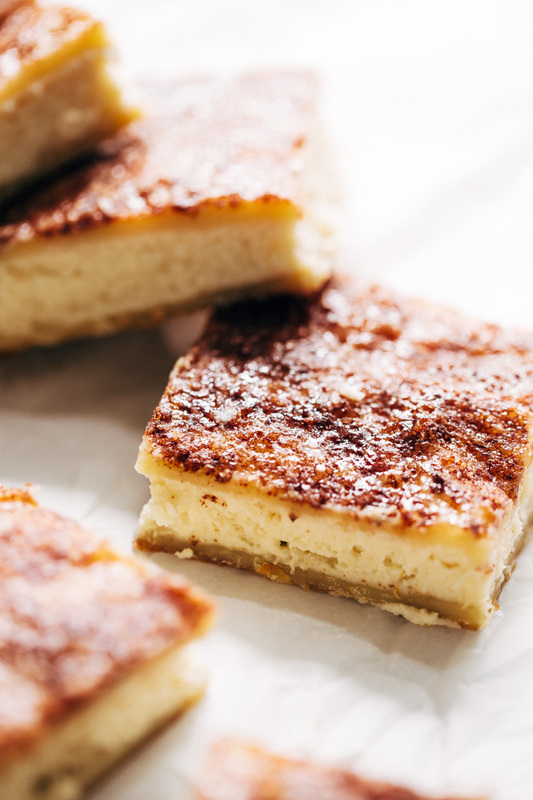 And now that we’ve established how amazing they are let me actually tell you about these sopapilla cheesecake bars. 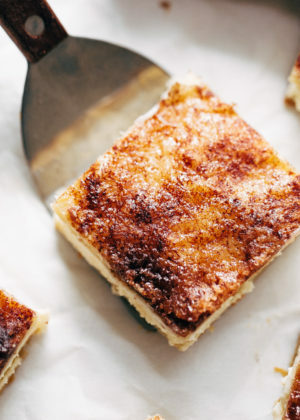 First, these cinnamon sugar cheesecake bars aren’t super sweet. Lately my tolerance for super super sweet desserts has gone way down. You’ll actually find me scraping frosting off my cake now which certainly never happened in the past. So these are at that sweet spot of sweetness. These bars start with a box of puff pastry dough. Most recipes tell you to use crescent dough but to tell you the truth, i’m just not a huge fan of the stuff. They’re overly salty and super doughy for my taste. But puff pastry is buttery, flaky, and light, exactly the kind of thing that we need. For the filling, you need your usual cheesecake ingredients. A couple bars of cream cheese, a little sour cream, an egg, sugar, and vanilla. For the snickerdoodle like topping – just a little cinnamon sugar and a few tablespoons of melted butter to get it all nice and crispy on top. 8 simple ingredients and i’m willing to bet you’ve got most of them at home already. ?? Make these and take pictures of your empty pans because they are going to disappear so so fast. 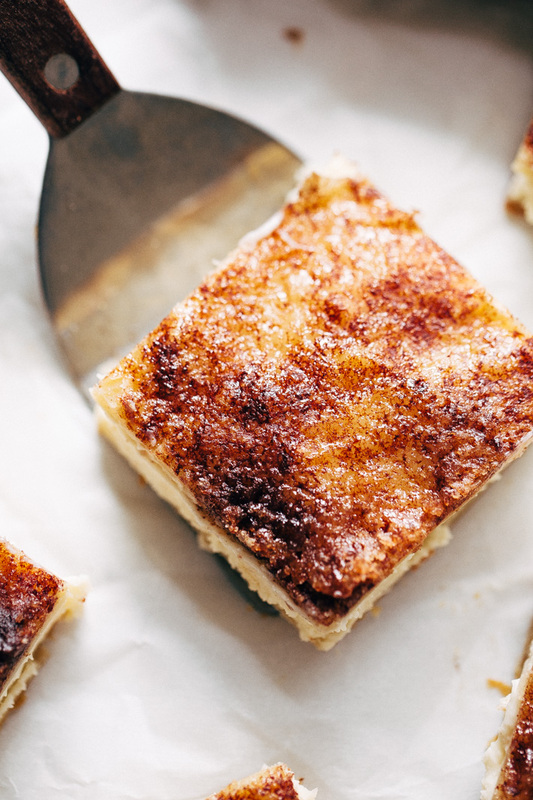 These sopapilla cheesecake bars will rock your world. Positon a rack in the center of the oven and preheat the oven to 400ºF. Spray a 9×13 dish with cooking spray. Use the first sheet of puff pastry and lay it flat into the baking dish. Do not trim the extra dough as the puff pastry will shrink a bit in the oven. Pay extra attention to the side and just gently press it against the sides of the dish. Use a fork to poke holes all over the puff pastry dough. You don’t want it to puff up in the oven. Bake the crust for 15 minutes. While the crust is baking, prepare the cheesecake mix. 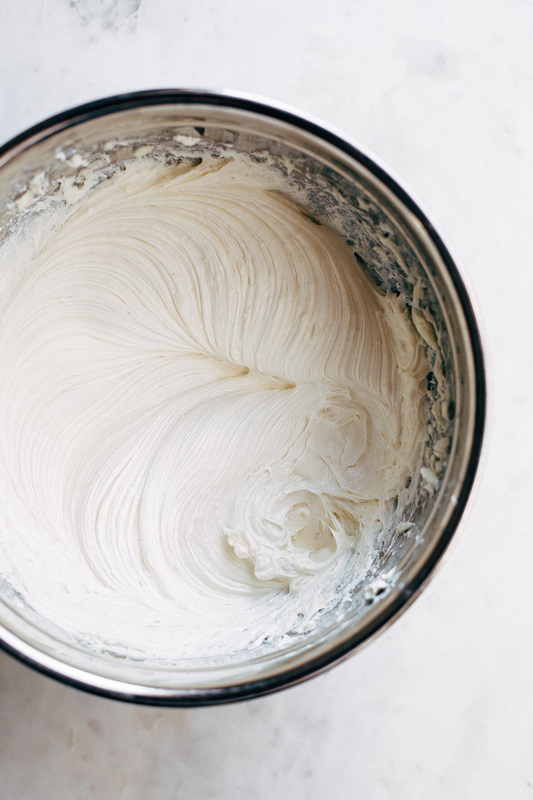 Beat the cream cheese and 1 cup of sugar for 2 minutes. 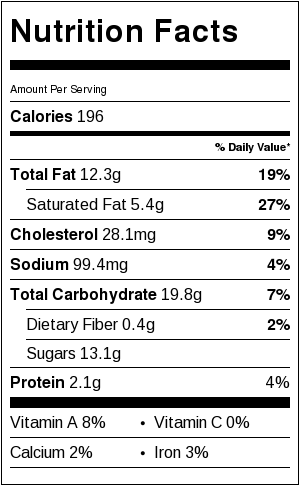 Add the egg, sour cream, and vanilla and mix until *just* combined, I’d say in the ballpark of 5-10 seconds. Remove the crust from the oven. If it has puffed up, let it sit for 5 minutes and it will deflate. Spread the prepared cheesecake mix onto crust. Top with the second puff pastry sheet and gently tuck in or crimp the sides. Combine remaining ¼ cup of sugar and cinnamon in a bowl. Brush half the melted butter onto the puff pastry sheet with a pastry brush and sprinkle with cinnamon sugar. Drizzle the remaining butter over the top. You don’t have to be too precise. Bake for 20-25 minutes or until the top puff pastry sheet cooks all the way through. Don’t worry if the crust puffed up, it’ll release the steam as it cools, or you can just use a paring knife to poke a small hole so the steam escapes. Let cool for 20 minutes as room temperature. Then cool completely in the refrigerator for several hours before serving. I usually make these 1 day ahead so they have a chance to set. Slice into bars using a clean knife, be sure to clean your knife with each cut so the bars have nice clean cuts. Just add a pinch of salt into your butter if it’s unsalted. I don’t suggest using low fat or fat free cream cheese for this recipe.